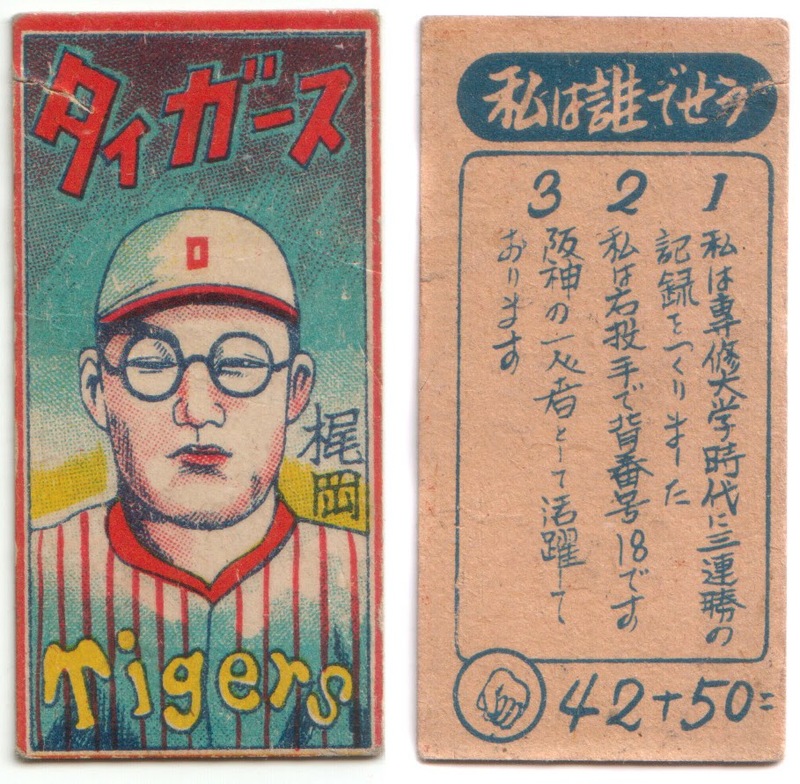 The 1952 Topps design is considered by most to be the best. 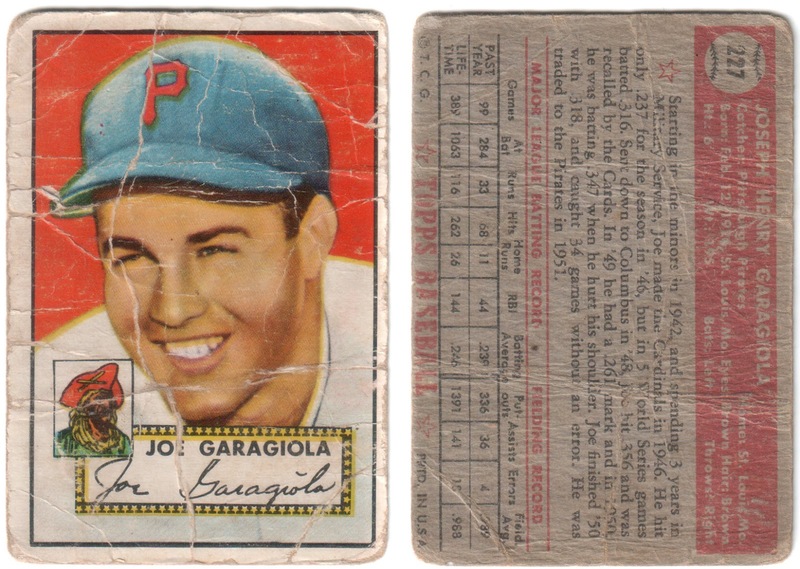 And when it comes to individual cards, this Joe Garagiola ranks right up there too. My memories of Garagiola are not as a player but as an announcer with the NBC game of the week. I remember Garagiola and Tony Kubek and Vin Scully and Bob Costas. As a kid, I would have to tune into the Saturday game to get my baseball fix. There was no ESPN and my local team was not on T.V. Garagiola was a good catcher who was considered a great prospect. He grew up on the same street at another catcher — Yogi Berra. Of his catching abilities, Garagiola once said: "Not only was I not the best catcher in the Major Leagues, I wasn't even the best catcher on my street." What can I say? This poor old baseball card was well loved. McCahan was a two-sport athlete playing both baseball and professional basketball — a member of the Syracuse Nationals of the National Basketball League. As a baseball player, he threw a no-hitter in his rookie season of 1947 against the Washington Senators. A second-inning throwing error kept him from the perfect game. 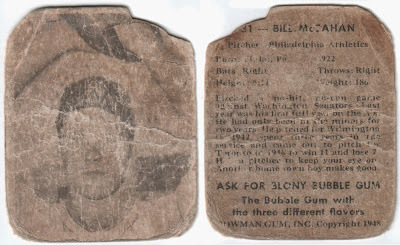 Bill McCahan is not exactly a household name. How did this card survive? I mean, when the card got to a certain point, why wasn't it just tossed in the garbage? How did it get so worn? My guess is it lived in the back pocket of it's first owner. Or, maybe it was kept in his shoe for safekeeping. And finally, who would want this old piece of cardboard? The answer: me. And I love it. Choosing which cards I post is sometimes difficult. If you're a regular reader of this blog, you've probably come to realize I'm partial to the older cards. The older and poorer the better. 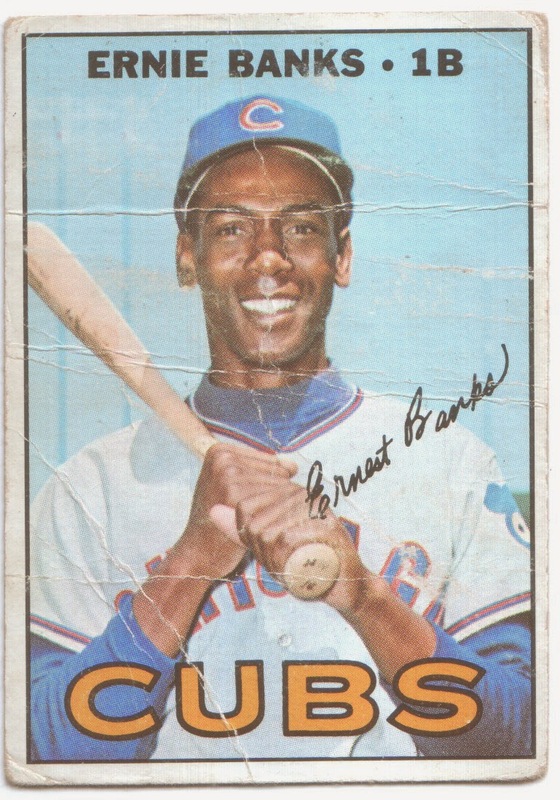 So when I came across this 1970 Topps card, I had reservations. It's not of a notable player. It's not particularly rare. It's not valuable. It's got it's share of creases and bends, put I've posted much worse. The thing is does have going for it is the team: Seattle Pilots. Check out that uniform and cap. The Pilots were born in 1969 and by 1970 had already vacated the Pacific Northwest to become the Milwaukee Brewers. New owner Bud Selig didn't get final approval to move the team until only a few days before the 1970 season was scheduled to begin. He had intended to change the team's identity but was left with the old Seattle uniforms and colors. Milwaukee never did change its colors. Though a different shading, the blue and gold remain. Thanks to the Seattle Pilots. I learned something new today. Warren Spahn hit 35 homers in his career —ranking him third behind Wes Ferrell (38) and Bob Lemon (37) for pitchers all time. He was around a long time, playing 21 seasons and acquiring 363 wins. His cards are readily available and relatively affordable. And I've got my share. 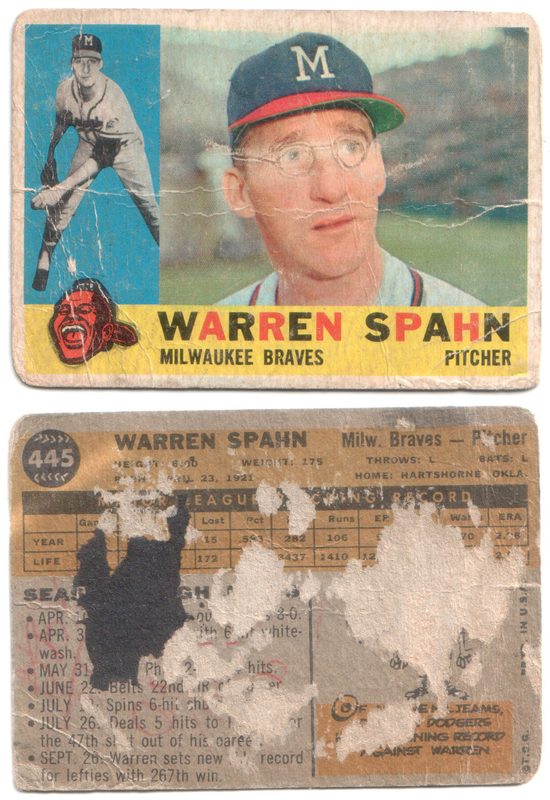 I must have more poor old Warren Spahn's than any other player. And this card does not disappoint. Take a look: creased, rounded corners, scuffed, pen marks, glued to a scrapbook and glasses drawn on his face. 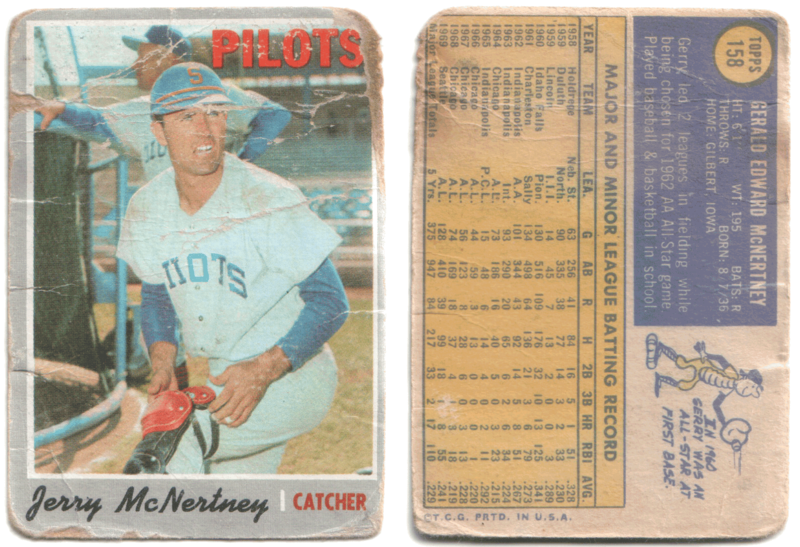 When it comes to poor old baseball cards this one checks all the boxes except for ripped in two. For all it's flaws, I love it. How can you not love Warren Spahn? I once had a colleague propose that baseball's Hall-of-Fame should be limited to a certain number of members. An interesting argument. In other words, if a new player is deserving, an older player must be removed. Top 100 players only. Frankie Frisch would not approve. Some say it's his fault the Hall has so many mediocre players. As a member of the Veteran's Committee, Frisch is said to have used his influence to usher in what some consider the Hall's least-deserving members. My thought is this: Either you're a Hall-of-Famer or not. If you need to make an argument for a player's inclusion, maybe he's not deserving. A Hall-of-Famer should be automatic, you should't need to think long about whether they're worthy. I've been waiting for this card for a while. 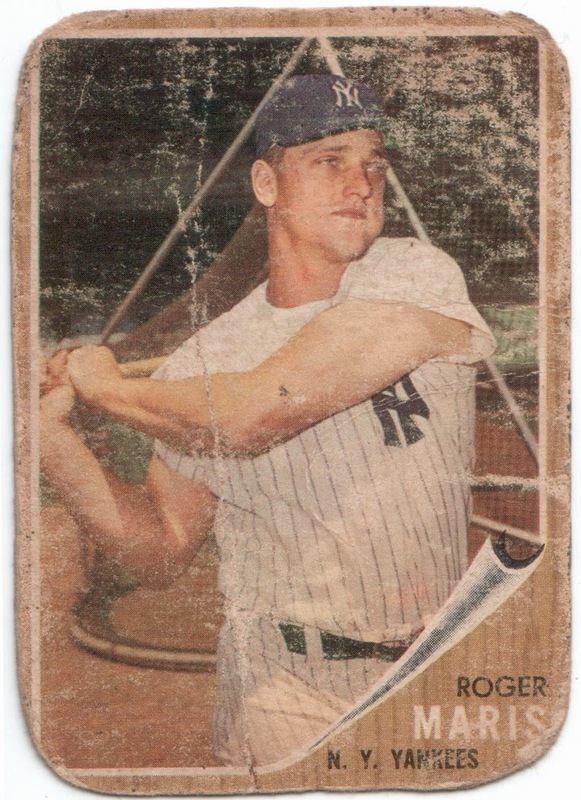 As a collector of poor old baseball cards, I've been looking for that perfect 1962 Roger Maris. And by perfect, I mean perfectly poor. As I've mentioned before, I rarely purchase any baseball card that is not in poor condition. I can't justify spending big bucks for a card I can get for a fraction of the price. Plus, I like my cards to tell a story. And this card's story probably includes the back of someone's jeans pocket. As the new single-season home run king, Maris was on top of the baseball world in 1962 and must have been one of the most desirable cards of that year's set. That, along with the fact it's card No. 1, means condition will always be a concern. I can just imagine unwrapping this gem in the summer of '62. I'm sure it's new owner couldn't help sharing it with friends, keeping it in his back pocket for safekeeping. Come to think of it, that's where I kept it when it arrived a few days ago – in my back pocket (in it's rigid sleeve) ready to show the world my latest find. A month after a winning bid on eBay, my first Japanese baseball card arrived from half-way around the world. 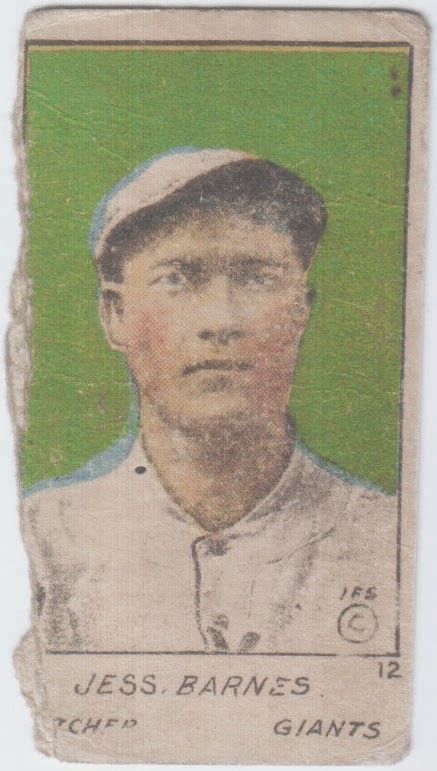 The listing said it's of Tadayoshi Kajioka, a pitcher who would win 131 games in the Japanese league. Is it really Kajioka? I have no way of knowing. Does anyone out there read Japanese? I'd love to know what the card says. Regardless, it's a valued addition to my poor old baseball card collection. As a matter of principle, I don't usually buy graded cards. You might say I'm downright opposed to encasing these poor old baseball cards in plastic. But this card is different. As a kid, before the Internet, I used to buy most of my cards from a dealer in Northern California. He would send me a list of cards he had available and every few weeks I'd place my order. Then, like now, I gravitated to the older cards — T206's and strip cards made up the bulk of what I collected. Back then, HOF strip cards would run about $10 or so. Bigger names like Ty Cobb would be more. Commons would be available for about $3-$5. Except Pickles Dilhoefer. Pickles would always be listed at HOF prices. I couldn't justify spending that kind of money for a ballplayer who's only claim to fame was being part of a trade involving Grover Cleveland Alexander. Thirty years later, I want Pickles Dilhoefer. While it's never about the money, my purchase of these poor old cards are in a sense an investment. I always try to pay what I think the card is worth, never more. But when it came to Pickles, my sense of 'want' overtook my sense of 'worth.' This card cost me $27. Is it worth it? I'm not sure. But it doesn't matter. I am the proud owner of my very own Pickles Dilhoefer. 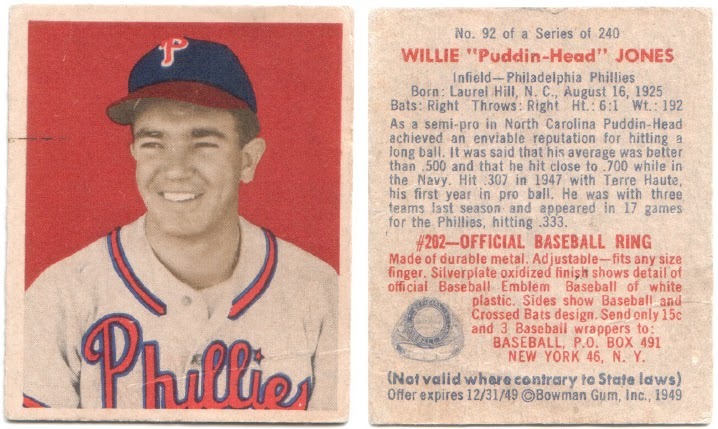 On the surface, this card appears to be a 1962 Post Cereal card, taken right off the back of the box. But a few clues tell otherwise. The most notable being the advertising on the back. Post inserted two cards in issues of the April 13, 1962 Life Magazine. It was part of an ad linking Post Cereal and subscriptions to Life Magazine. Mickey Mantle and Roger Maris, coming off their battle for the single-season HR record, were promoted heavily and the only two players to appear in the advertisement. The perforated edges and lack of blue lines separating the stats provide us with other clues that this card is not a cereal box card. Sometime during this card's life, Mantle was ripped in two. Was it done when separating the card from the ad? Was is done in later years? Who knows? What I can tell you is it wasn't done recently. That transparent tape is brittle and old. If only baseball cards could talk. Gerald Walker is no Joe DiMaggio. Walker, more commonly known as Gee Walker, was a pretty good player. He was named an All Star in 1937, beginning that season (on Opening Day) with an "unnatural cycle" (a cycle in reverse order: HR, 3B, 2B, 1B). He had a good career. 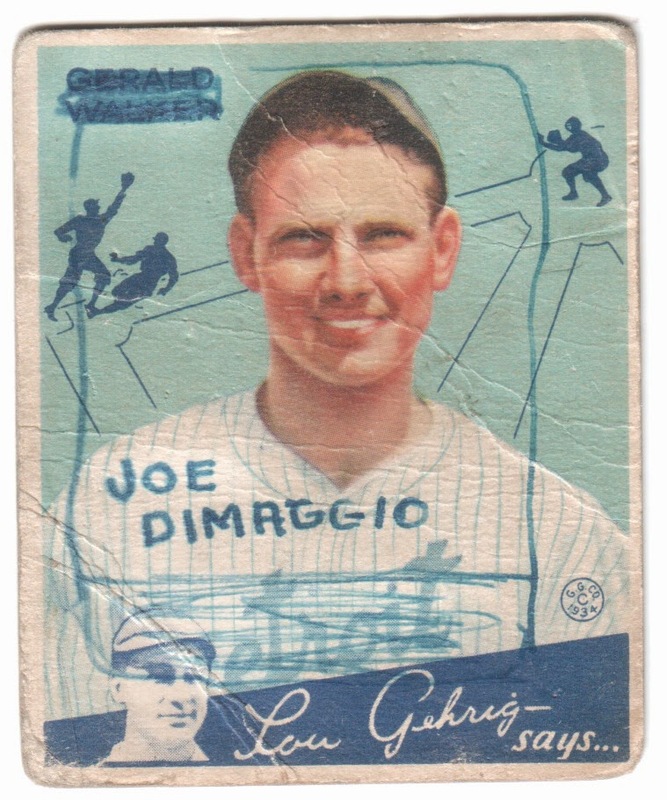 So who would scratch out Walker's name in 1934, replacing it with a not-yet-Major Leaguer named DiMaggio? My guess is this creative drawing was done a few years later. DiMaggio was in the Pacific Coast League in 1934, an outfielder with the San Francisco Seals. He would not make his Yankees debut until 1936. Was DiMaggio even on the baseball world's radar in 1934? Maybe he was. 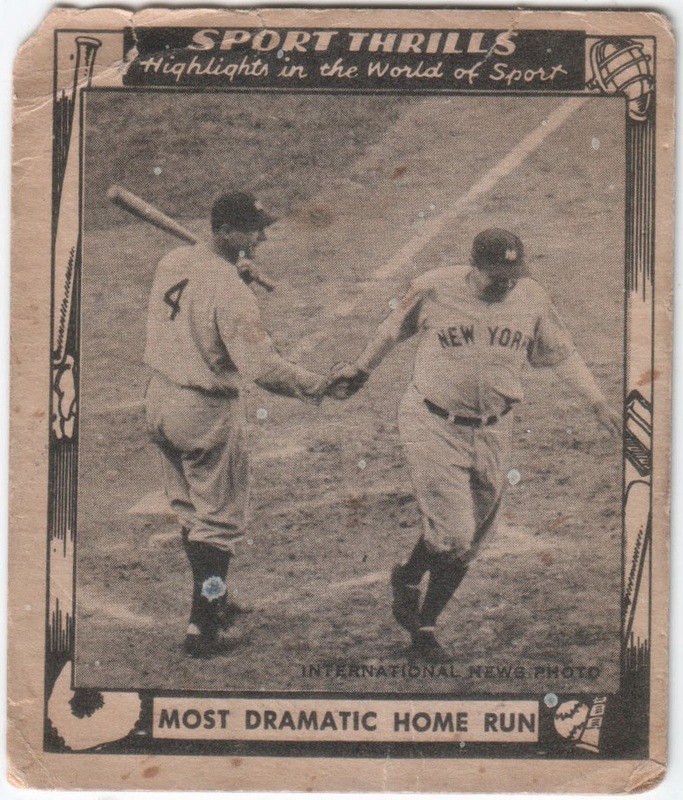 In 1933, DiMaggio hit .340 and was undoubtedly in the news for his 61-game hitting streak. Between May 28 and July 25, he hit .405 (104-for-257). I'm sure that opened a few eyes. Maybe even for a young baseball collector hoping to have the next up-and-coming star. You think? I've been on a break from Poor Old baseball Cards lately. But today, this came in the mail and I knew I needed to share. A few days ago, I took a chance. I offered $7 for this beauty on eBay. It had a Buy it Now price of $15. I expected to be counteroffered. I wasn't and the card was mine for $7. What a bargain. Clemente was coming off his second batting title in 1964. He would win the title four times (1961, '64, '65 and '67). He ended his career with 3,000 hits. Who knows how many more were in his bat before dying in a plane crash carrying relief supplies to Nicaraguan earthquake victims. While it's a beaut, there's one thing that bothers me about this card. "Bob." His name is Roberto and he wanted to be known as such. I wonder why baseball card companies felt the need to Americanize his name? While Clemente amassed a mountain of impressive statistics during his career, he was often mocked by the print media in the United States for his heavy Spanish accent. Clemente was also subjected to the double discrimination of being a foreigner and being black in a racially segregated society. 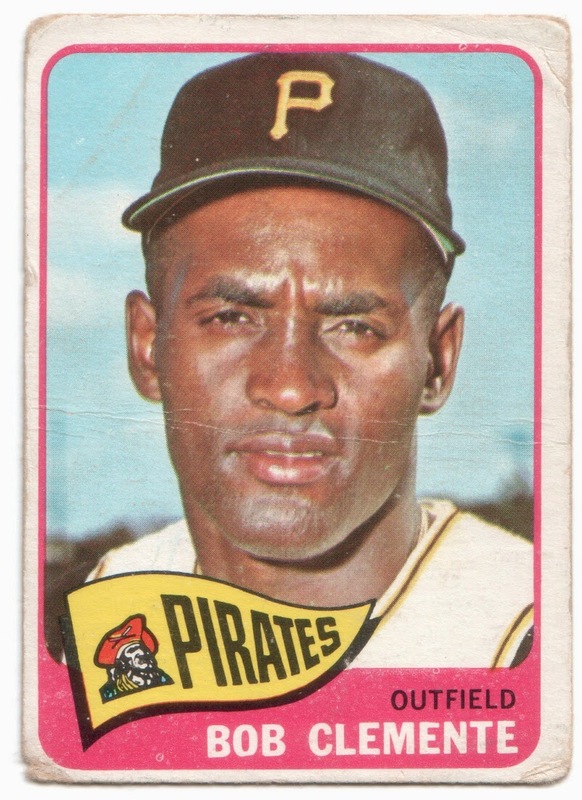 Although the media tried to call him “Bob” or “Bobby” and many of his baseball cards use “Bob,” Clemente explicitly rejected those nicknames, stating in no uncertain terms that his name was Roberto. There was also confusion over the correct form of his surname. For 27 years the plaque at the National Baseball Hall of Fame read “Roberto Walker Clemente,” mistakenly placing his mother’s maiden name before his father’s surname. Only in 2000 was it changed to its proper Latin American form, Roberto Clemente Walker. It must have been 1982 or so and I was earning about $20 every Saturday helping my uncle put newspapers in racks around town. One day after completing the route, we stopped by a local baseball card shop. If my memory serves me, baseball card shops were starting to spring up about then. A few years later, there would be hundreds to choose from. As I made my way throught the shop, I felt like a kid in a candy store. I know that phrase is overused but that's the best way I can describe the feeling I had as I saw shelf after shelf of vintage cards in cases. The pricetags were scarry for a 13-year-old. Mickey Mantle, Ted Williams, Earnie Banks, Willie Mays. Superstar cards selling for $20-30 each! How could I justify spending my entire earnings on a single card? What would my mom say if I told her I spent it all on a baseball card? Instead, I gravitated to a binder marked 25 cents. Looking through, I found my first poor old baseball cards. 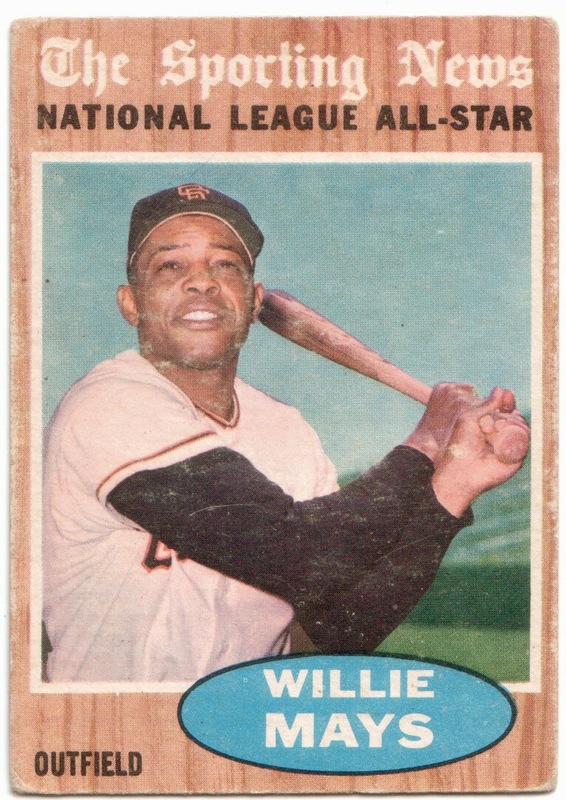 Warren Spahn, Bob Lemon, Ed Mathews, Luis Aparicio, Early Wynn, Al Kaline, Juan Marichal and this Willie Mays. All cards from the late 1950s into the 60s. I was thrilled. I must have spent $3-$4. Each card went into my binder. It was in that same shop that I bought my first Bowman, a 1955 Art Ditmar. 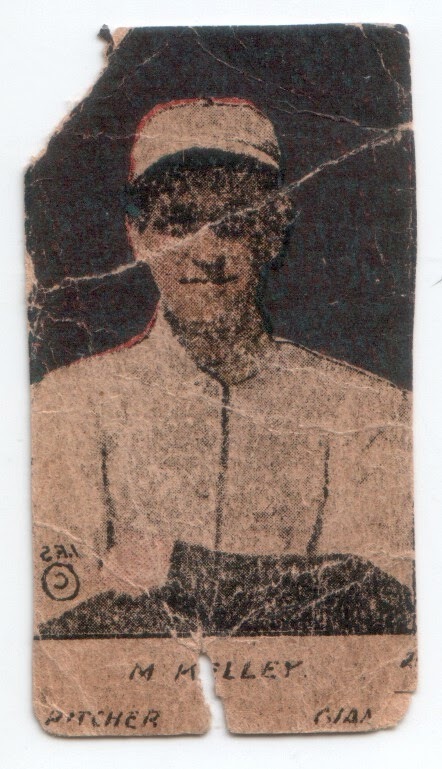 Later I learned about Goudey and bought a 1933 Phil Collins. And then I saved up for my first T206, a George McQuillan. 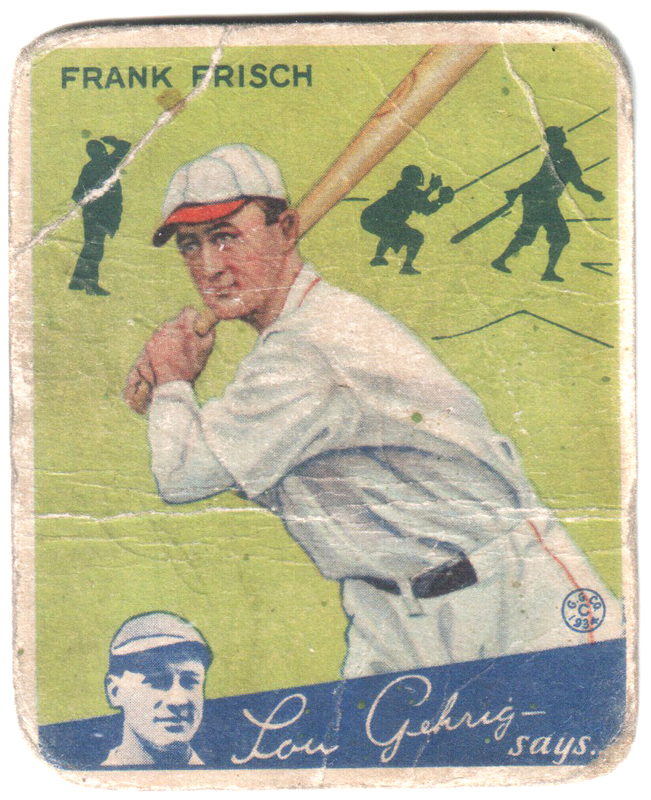 I remember, for some reason, really wanting a 1933 Goudey Frankie Frisch. I must have called that shop every day for months asking the owner it's price. It was always too much. A week ago I got a 1934 Goudey Frankie Frisch. I'm still waiting for that 1933. It's one thing to have a pejorative nickname, it's another to have it printed on the back of your baseball card. At least I assume it's degrading, right? When trying to find the meaning of 'Puddin-Head' I got several explanations. One refers to the fact that Willie Jones wasn't the brightest bulb in the box. Another attributes it to a popular song of the 1930s. A third says Jones was hit in the head, not ducking while sliding into second base. A fourth says he actually liked to eat pudding. So which was it? Anyone out there know? Jones himself was a pretty good third baseman and two-time All-Star. He was an important part of the 1950 Whiz Kids team. And he had a unique nickname. Today I learned that Allie Reynolds was part of the Creek Nation. And as a Native American ballplayer, he was nicknamed Superchief. In baseball's days past, most Native American players were nicknamed Chief: Chief Bender, Chief Meyers. Slow farmboys were called Rube: Rube Marquard, Rube Waddell. Deaf players were called Dummy: Dummy Hoy. Dummy Taylor. Today, these nicknames would not be tolerated. 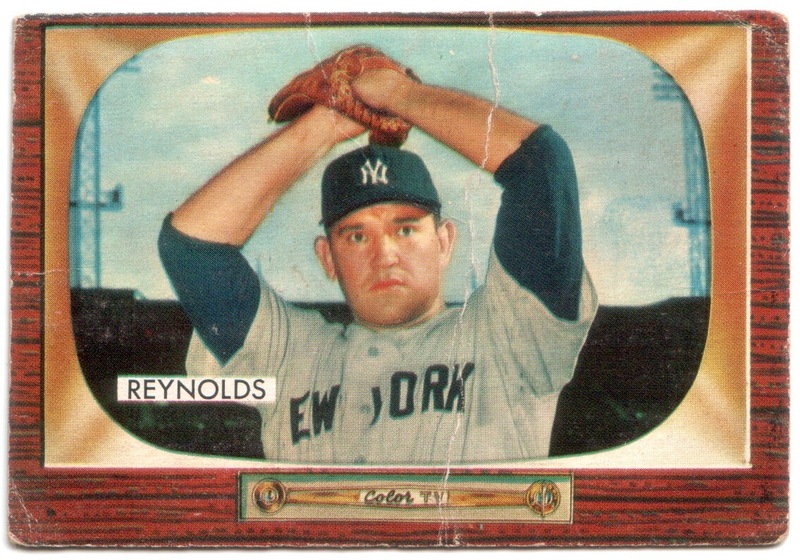 Reynolds played at least 40 years after the other players mentioned. I've never heard of anyone calling him Superchief. He's always been known as Allie as far as I knew. But that's not the case for the others. I would have to think hard to tell you Chief Bender's real first name is Charles. And did you know Marquard's real name is Richard and Hoy's is William? Reynolds was actually a pretty good pitcher for some pretty good teams. He threw two no-hitters in one year, was named to six All-Star games and won 6 world championships as a member of the New York Yankees. Many consider him a borderline Hall-of Famer. More than just a nickname. After reading this post, log onto eBay and type in "1968 Topps Harmon Killebrew." Buy it. One in this condition should cost you about $2. One in much better condition about $5. Take the card, admire it for a few days and then give it to a kid. It doesn't matter if it's a son or grandson, daugher or granddaughter, nephew or niece. Explain that Harmon Killebrew was one heck of a ballplayer and one of the game's good guys. Tell them of his 573 home runs, his 13 All-Star appearances and his 1969 MVP season. Tell them about the time he hit a ball 520-feet in Minnesota or the time he hit a ball over the left field roof at Detroit's Tiger Stadium. Tell them how he was elected to the Hall of Fame in 1984. And make sure to tell them about his character. That he was a nice guy. That he played fair and with humility. I had never seen one of these cards before this one arrived a few weeks back. The 32-card set was exclusively comprised of members of the Pacific Coast League's Oakland Oaks. And while Charlie Dressen would make a name for himself as manager of Brooklyn's Boys of Summer from 1951-53, the best know acorn on the team was a young infielder named Billy Martin. Only available in the Bay Area, this is a fairly rare set but not a particularly expensive one. Distributed in loaves of Remar bread, samples can be found for under $10. What a treat to go along with that peanut butter and jelly sandwich. I was talking to a local baseball card store owner a few weeks ago and I was explaining my preference for poor old baseball cards. The man said he was reluctant in buying poor cards because there's no market. It's not like someone comes in every day asking for a ripped Mickey Mantle or a heavily creased Willie Mays. But there's something I've noticed lately. The value of poor old baseball cards is going up, up, up. A few years ago, this Highpockets Kelly would have fetched about $5 in this condition. I paid $15. A few years ago, I could find a ripped or heavily creased T206 for under $10. Today, you'd need to spend about $12-14 for the worst of the worst. Yesterday, I bid on a lot of 12 1933 Goudeys. Each had a hole near the top where it was obviously pinned to a corkboard. These cards were in bad shape, and that's something coming from me. I was outbid at $52.09. Time after time I'm seeing these cards selling for higher and higher prices. I find that to be both sad and exciting. Sad that it stretches my wallet and exciting that these old gems are being appreciated. I guess I'm not the only one out there collecting poor old baseball cards. In every post, I try to give a little information about each card. 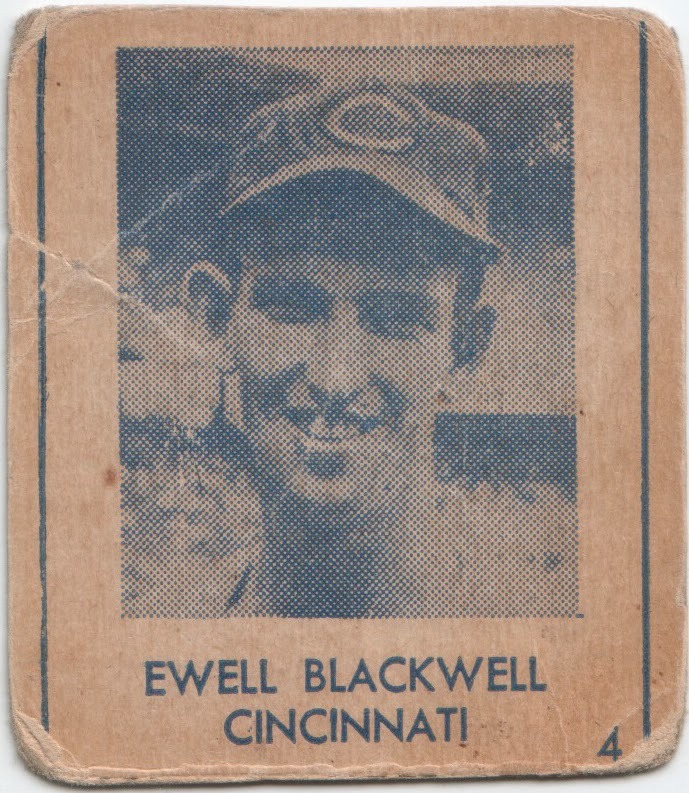 What I do know is Ewell Blackwell was considered one of the most feared pitchers of his day. Think Randy Johnson. He was a tall (6-6) and lanky. And he had an unconventional sidearm delivery. In 1947, he was one inning away from tying teammate Johnny Vander Meer as the only pitcher to throw consecutive no-hitters. That being said, I honestly know little about this Blue Tint set. First, a little inside baseball card talk. This card is designated by an 'R' as in R346. Generally speaking, that means it's a gum and candy card. But from what I can tell, this card was available in strips, meaning it should be designated a 'W' card. There's no doubt it was hand cut but I've read it was available in strips of six or eight cards. But where was it available? Was it sold in vending machines or in corner stores? Surely there's someone out there who can share their knowledge of this not-so-common set. Generally speaking, you'd be lucky to find Mickey Mantle or Jackie Robinson cards issued during their playing days for less than $40. 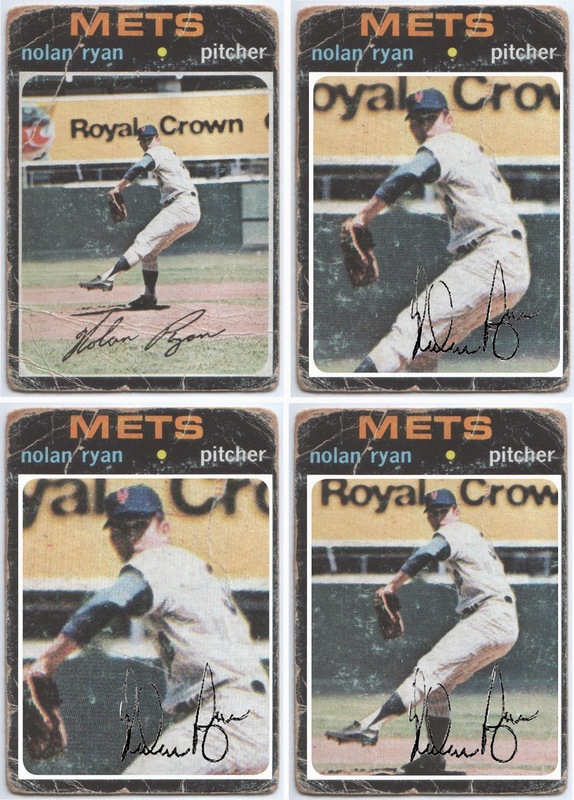 Poor old Willie Mays, Hank Aaron, Roberto Clemente and Sandy Koufax cards are a bargain between $10 and $15. Lou Gehrig and Babe Ruth? Good Luck finding Gehrig for under $400 in any condition or Ruth for under $700. I've been looking for a 1933 Goudey Babe Ruth for years but can't seem to find the right one. Even those that appear to have been driven over by a truck will set you back $800. While it's not a card issued during their playing days, this 1948 Swell Sport Thrills card is a fairly rare and early card of the duo. Is there an earlier card featuring the two Yankee legends? I admit it, I paid $75 for this beauty. Did I get a good deal? How much would you pay? I know it's one of the most desirable cards in the 1971 Topps set. And I know Nolan Ryan was one of the best I've ever seen pitch. But I don't care for this card, at all. Sorry. The real card (top, left) is awkward. The photo is terrible and that Royal Crown advertisement is crooked. Maybe that's just the graphic designer in me. So I tried my hand at making it better. I used the same lame photo and just moved it around a bit. I like card No. 4, on the bottom, right. The only problem, the sign now reads Royal Crow. Hey, there's only so much I could do with what I had. Now that's what you call a crease. Tommy Thevenow hit two homers during the regular season. Both came in 1926 about a week apart. Both were of the inside-the-park variety. He also hit another in the World Series, another insider-the-parker, giving him three that year. He would hit no others. For the remainder of his career, a total of 3,347 at-bats, Thevenow would not hit another round-tripper, a major league record. 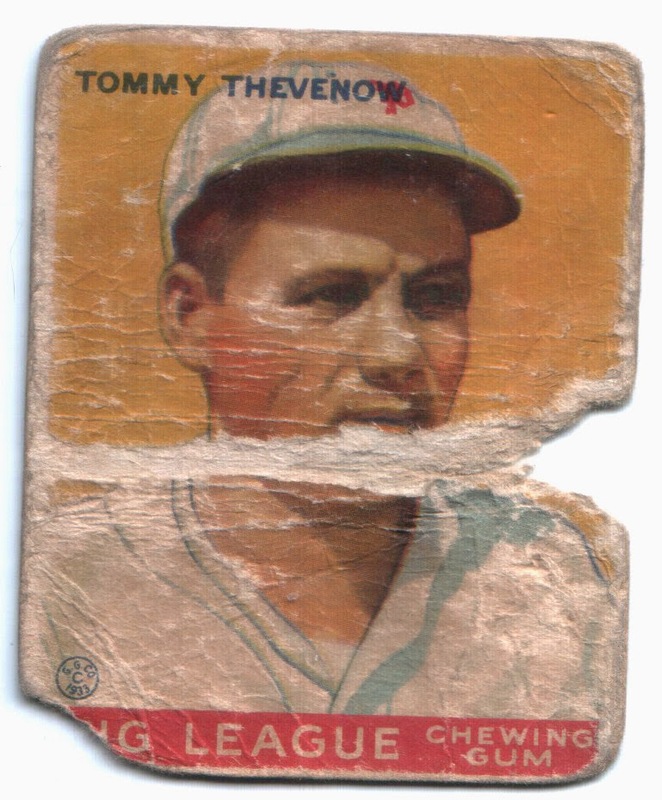 For most of his 15-year career, Thevenow struggled at the plate. Except during the 1926 World Series. He finished 10-for-24 with a .417 batting average, helping the Cardinals to a world championship. I knew none of this before that crease attracted me to purchase this poor old baseball card. It's amazing what prompts us to learn about these old ballplayers. Sandy Koufax went out on top. And in pain. In 1966, Koufax went 27-9 with a 1.73 ERA. He led the league in wins, ERA and strikeouts (317). He was an All Star, won his third Cy Young award and finished second to Roberto Clemente in MVP voting. 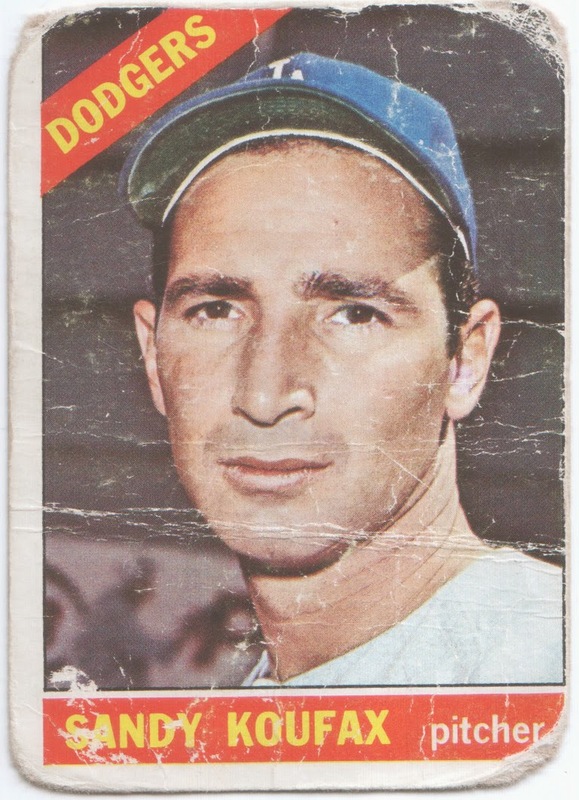 Yet, on Nov. 18, 1966, Koufax walked away from the game at the ripe old age of 30. The bottom line – Koufax realized the toll pitching was taking on his health and his arm. The pain was punishing. The pain was excruciating. L.A. Times columnist Jim Murray put it this way: "Baseball lost its left arm because Sandy Koufax didn't want to lose his." While I love my poor old baseball cards, this one makes me a little sad. This is Robinson's last player card before retiring at the end of the 1956 season. He was actually traded by the Dodgers to the hated New York Giants before calling it quits. Many believe Robinson refused to play for the Giants. But the truth is he was ready to retire no matter which team retained his rights. At 37, Robinson's skills were deteriorating and his focus was beyond baseball. He knew he had to support his family and agreed to become vice president of Chock full o'Nuts (coffee) in 1957. Now back to the actual card. I wonder if it was the trade that made someone color in Robinson's cap, covering up the 'B' for Brooklyn. Someone also erased the word Brooklyn and crossed out third base, writing in 2B. By 1956, Robinson was actually playing third base after giving up second base to Junior Gilliam. 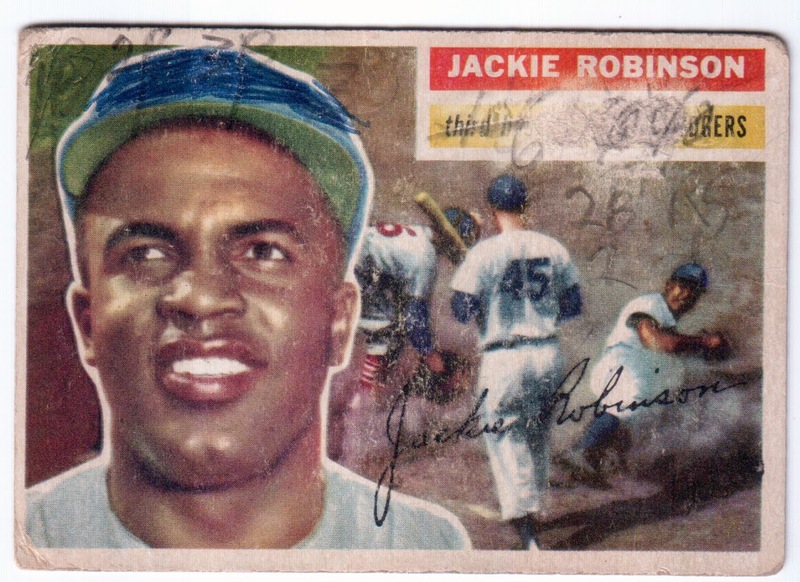 It's hard to imagine anyone today wanting to deface this vintage Jackie Robinson baseball card. But rivalries were serious in the mid-50s and so was the hatred for Jackie Robinson. I keep reading that the 1958 Topps design was considered a failure. Keyword: was. In recent years, the 1958 set has made a bit of a comeback. It's finally getting respect for its bright, bold colors and player portraits. 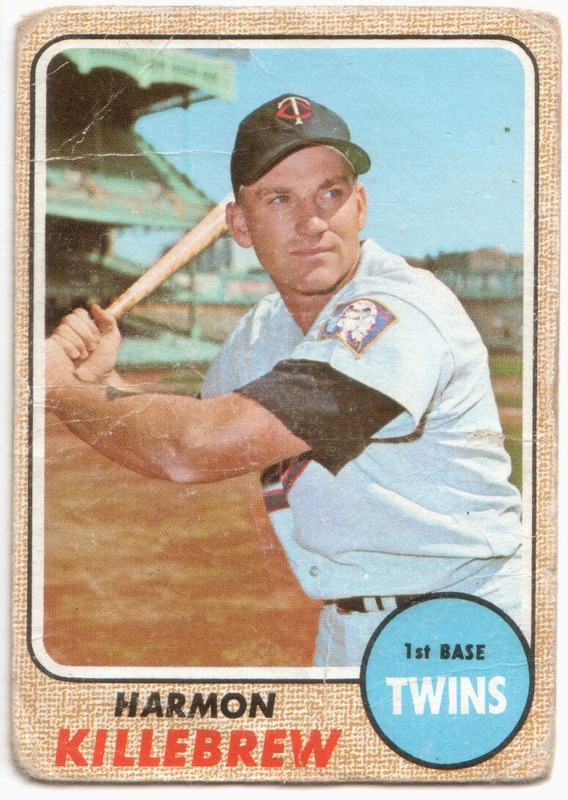 1958 was also a year of firsts: First Topps Stan Musial card. First team checklists. First time cards represented teams on the West Coast. I wonder what it was like for a kid in San Francisco to pull a Willie Mays or another in L.A. to find a Sandy Koufax, Pee Wee Reese or Duke Snider in his wax pack. There were plenty of other stars in the '58 set including Mickey Mantle, Ted Williams, Roberto Clemente and Ernie Banks. And there was also a rookie card of Roger Maris. 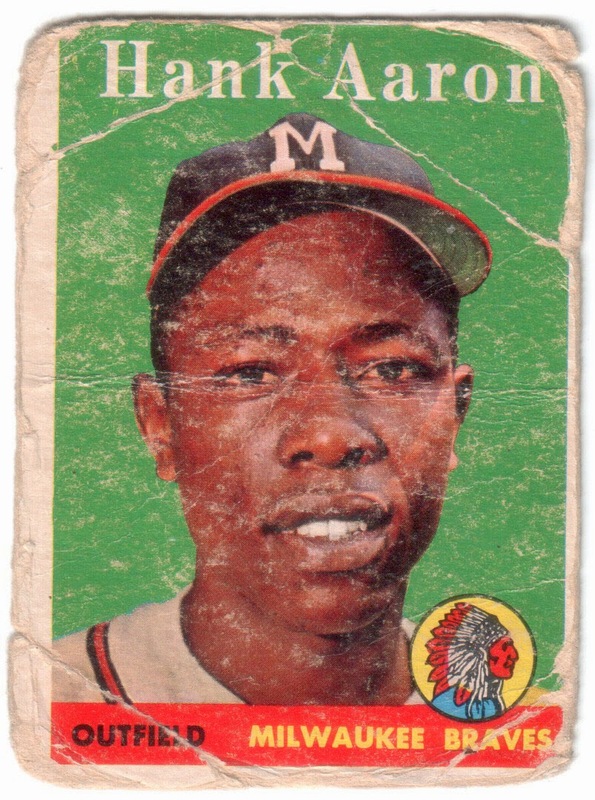 Another card most kids would have been happy to have was this Hank Aaron. The defending National League MVP was coming off a year in which he led his team to a World Series title. I still think Aaron is underrated when it comes to baseball cards. If he only played in New York. Would he be considered better than Mantle? It's been a while since my last post and I really wanted to make my comeback with something a little unusual. While this B18 blanket is not particularly rare, it's not something you see everyday either. First, I know, this isn't really a baseball card. 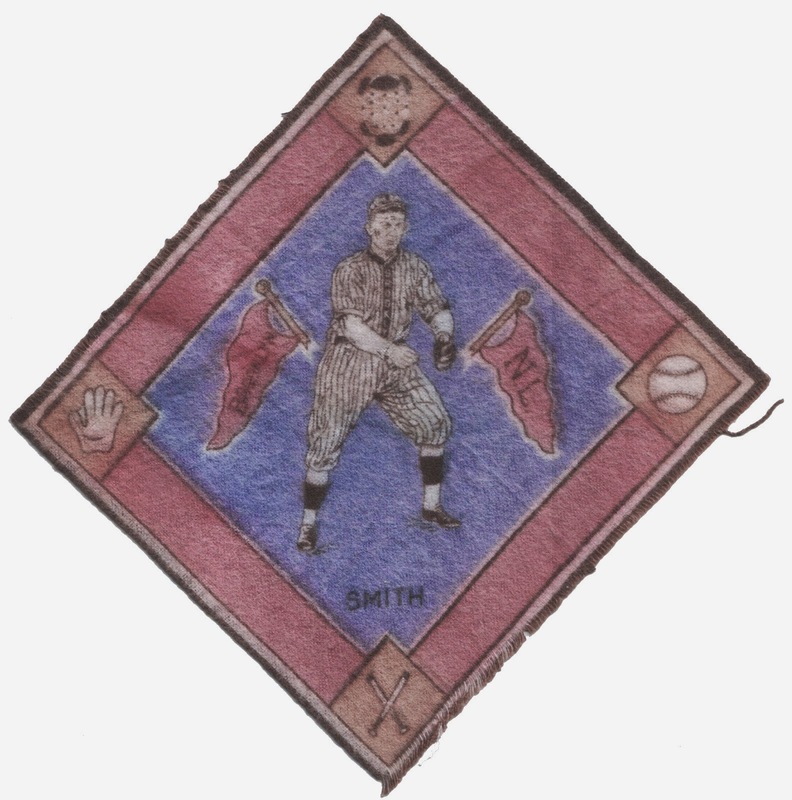 It's a 5 1/4-inch square felt which would have wrapped a pack of tobacco in 1914. Some say it wrapped a specific brand, but I've read conflicting reports that the brand was not limited to just one. It's called a blanket since many of these individual pieces were often sewn together into quilts or blankets. I wonder how many kids had bedspreads made from these felts 100 years ago? The blankets (the individual ones) come in various colors. Cleveland players have either yellow or purple bases; New York Yankees players have either blue or green infields; St. Louis Browns players have either red or purple paths; Washington players have either brown or green bases; Brooklyn players have either blue or green infields; New York Giants players have either brown or green paths; Pittsburgh players have either red or purple bases; and St. Louis Cardinals players have either purple or yellow paths. A third variation has red infields. And a quick look on eBay shows these selling for a huge premium. My example (pictured) is very poor. You know, poor in a good way. The blue is very faded and the paths and flags should be red. The bases should be brown. But hey, to me it's well worth its $5 price tag. There's no way you can get an equivalent baseball card at that price. What a bargain. Claude Rohwer was a career minor leaguer having played in San Francisco, Charleston and Sacramento. He was the younger brother of Ray Rohwer, who played in parts of two seasons with the Pittsburgh Pirates. 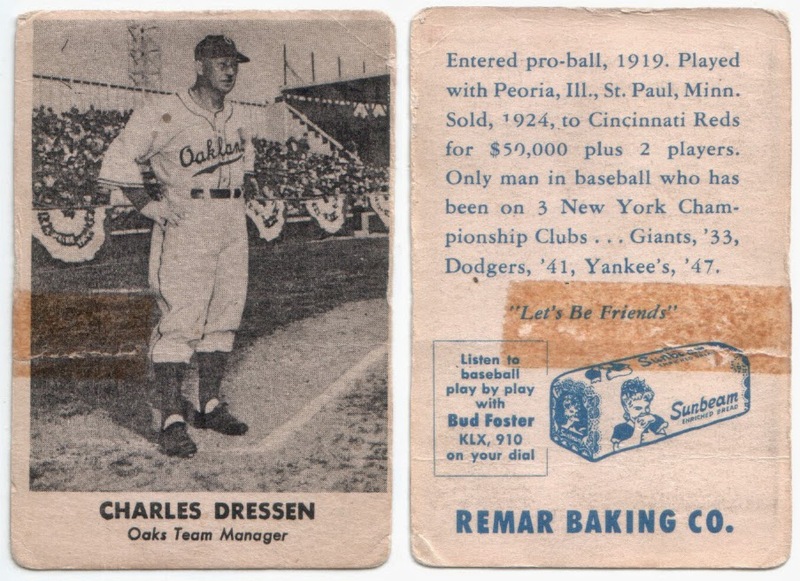 While the back of this card is blank, a previous owner left me a few notes: It reads: "Claude, 3B-SS-OF, not in ML." Claude Rohwer in a nutshell. His entire career summed up in only a few words. While his playing career might seem to be unremarkable, he was good enough to play in the old Pacific Coast League. Many at the time considered it to be the third major league. 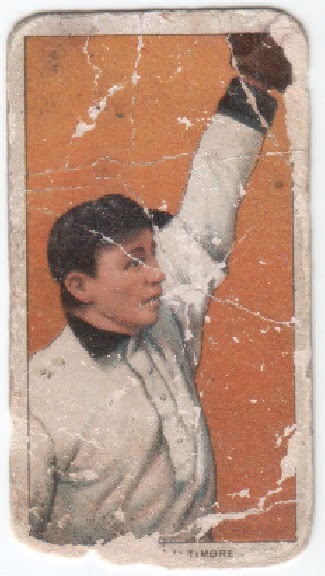 And as a player in the PCL he would be immortalized on this beauty of a poor old baseball card. These cards were produced from 1911-38 and found in boxes of Zeenut and Ruf-Neks candies. They came with coupons attached to the bottom of each card. The coupons were usually removed and exchanged for premiums. Cards with coupons add significant value to a card. While not unheard of, cards with coupons are rare. 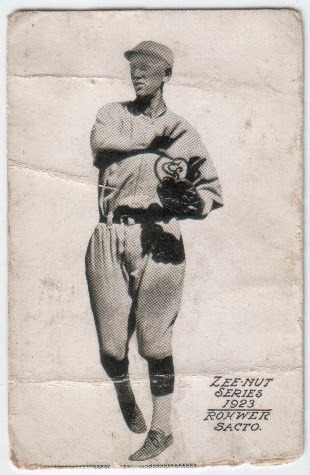 Coupon or not, this Zeenut has become a valued part of my poor old baseball card collection. The story goes that on Oct. 6, 1945, the owner of the Billy Goat Tavern bought two tickets to Game 4 of the World Series at Wrigley Field; one for himself and the other for his pet goat. The owner was let in but not his four-legged friend. The goat's owner was incensed, declaring that the Cubs would never win again. And so it has been, the Cubs have not won a World Series since. It's a good story and it may be true. But I have a different thought as to why the Chicago side hasn't won a world title since 1908. You see, Jimmy Slagle played center field for the Cubs in 1907 and 1908. The Cubs were World Champions both years, their only Series wins in their history. In 1909, Slagle was relegated to the minor league Baltimore Orioles. The Cubs finished second to the Pittsburgh Pirates in the NL. I think I may be on to something. Whenever I think of Goudey, I think 1933: Babe Ruth, Lou Gehrig, Jimmy Foxx, Dizzy Dean and Napoleon Lajoie. Beautiful. Bright. A classic set. This is not 1933. This is 1941 and the only names most anyone have ever heard of are Mel Ott and Carl Hubbell. Hall-of-Famers, sure. But not on the caliber of Ruth and Gehrig. The set consists of 132 cards: 33 players in yellow, blue, green and red backgrounds. Yellow is the most common followed by blue, green and red. The designs are plain to say the least and the backs are blank. Nonetheless, I was very excited when this card arrived. It met all my criteria for a poor old baseball card. A star player that is worn to the point it was ripped in two, only to be taped together. And somewhat rare. Think about it: If you were to walk into a baseball card shop you'd probably see a 1933 Goudey on display. But a 1941 Goudey? Not a chance. I know it's rough, but it's Jimmie Foxx. A real Jimmie Foxx. Foxx was mega-good. Better than your typical Hall of Famer, the Sporting News has him 15th on its list of 100 Greatest Baseball Players. He was a monster with his bat and unfortunately was overshadowed by the greatness of Babe Ruth. But I wonder if the casual baseball fan has ever heard of him? Some think Foxx was also the inspiration for Tom Hanks' character in A League of Their Own. Foxx actually managed the Fort Wayne Daisies of the All-American Girls Professional Baseball League in 1952. 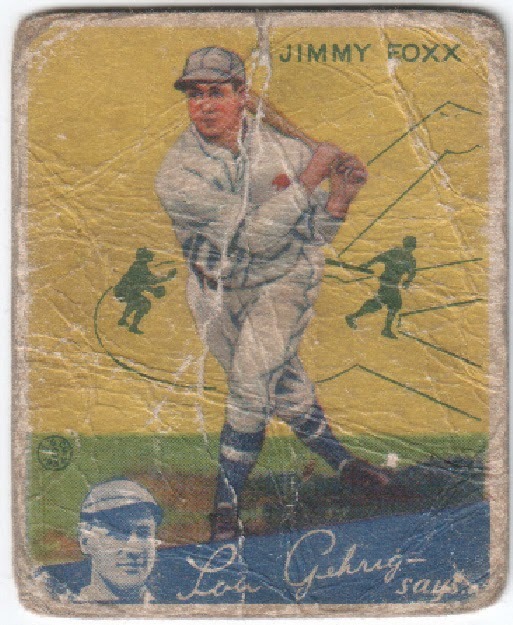 While reading up on Foxx, I found another 1934 Goudey Jimmie Foxx selling at auction in March of 2000 for $31,050. It was graded PSA 8. I paid $75 for mine. I know, kinda steep, but did I mention it was a real Jimmie Foxx? I'd still rather have my poor old Jimmie Foxx and $30,975 than that PSA 8 any day. 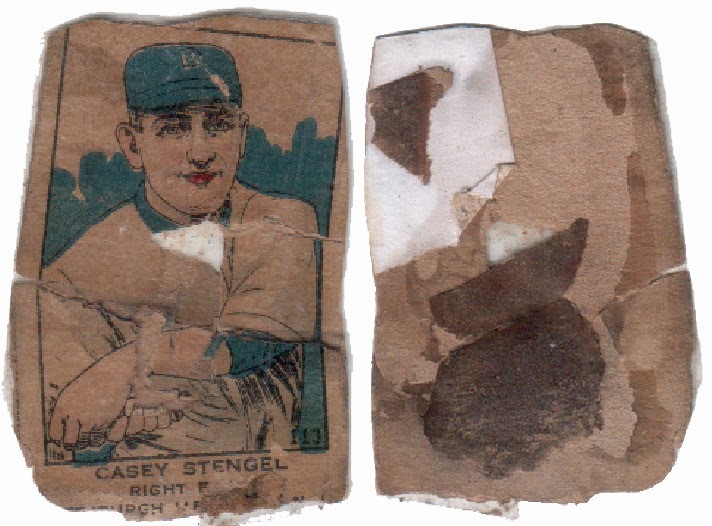 Though this set was produced from 1919-21, Stengel only played in Pittsburgh from 1918-19. Stengel was a decent-enough ballplayer but a superstar manager. Most would recognize him as the Yankees manager of the 1950s. As such he was a 7-time world champion. He won another championship in 1922 as a player for the New York Giants. This strip card is held together by tape (unfortunately stuck to the front of the card) and has evidence of having been attached to a scrapbook. Without the tape, it would probable be in a half-dozen pieces. 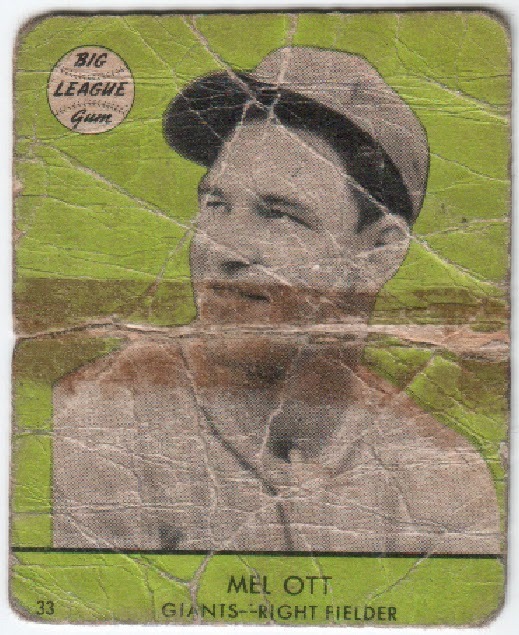 It's missing a chunk from bellow Stengel's neck and the info at the bottom of the card is partly missing. But really, I don't care. I think it's pretty cool for a 95-years-old piece of cardboard.